A friend taught me to knit during my junior year of college. A couple of months later, I had the awesome opportunity to take a college class on knitting. It was taught by two of my college professors (an Historian and a Psychologist) as part of my Liberal Arts college’s January Interim term. For four hours, five days a week, and for a whole month, we went to class and learned all about the history of knitting, how to cast on, knit, purl (which I learned I had been doing incorrectly prior to this), cable, felt, you name it. We tried out different types of needles, including bamboo, acrylic, circular, straight, and double-pointed needles (DPNs). One of our homework assignments was to straighten out our circular needles to get the kinks out of the plastic cable that connects the two needle tips. Living on a college campus, I didn’t have access to a stove, so I tried being creative. First I tried to boil water in a crockpot, which didn’t work. I then tried to microwave my needles. This also didn’t work, and it had the added benefit of melting the glue that held the cable to the bamboo tip, so when I tried to pull the cable straight, it came clean out of the needle tip. I tried to put it back, but the glue cooled too fast. Logically, I put them back into the microwave to melt the glue again. Eventually I managed to convince one of the Residence Directors to let me boil water in his apartment while he played Guitar Hero. 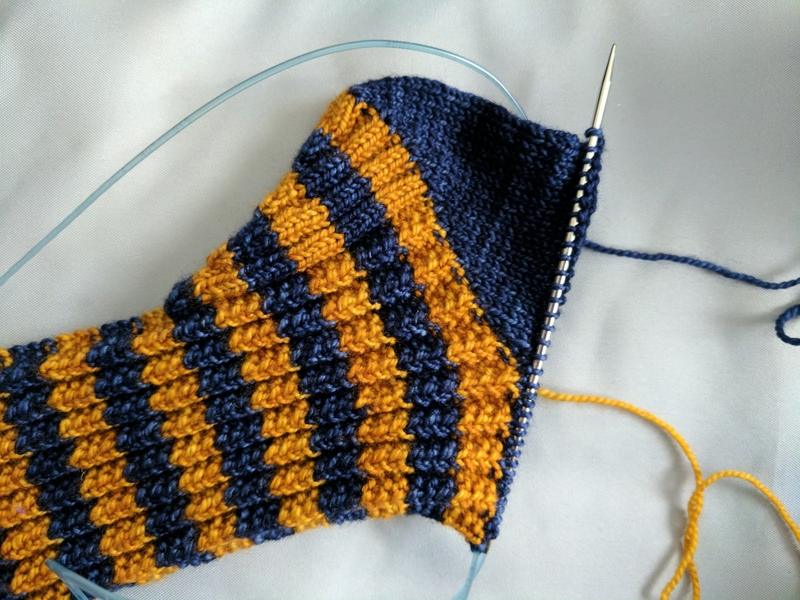 Last weekend, I found myself growing annoyed with my circular knitting needle cables going in all the wrong directions as I tried to knit a pair of socks using the magic loop method. Back to the stove I went! Boil a pot of water deep enough for your needles to not be too curled when you dip them in. I used a medium-sized sauce pan. Have a hand towel ready. Keep the cable in the water for 30-60 seconds. Pull the cable out of the water, then, holding one needle in one hand, use the other hand to wrap the cable with the hand towel near the top needle, and slide the towel down the cable to the end. This straightens the cable out. I was able to remove most of the curls from my cables. Because I’ve left these in projects for long periods of time, I’ve got a couple of actual kinks in the cables that I wasn’t able to remove, but they will be untangled enough to lessen my frustration for a while!